Branding is a word that’s tossed around quite a bit in the design, marketing, and entrepreneurial circles these days (myself included). And while industry people generally know what we mean by that term, if you’re not in one of those fields you might be asking: what is branding, exactly? Particularly in the design field, it’s used interchangeably to mean your logo and colors. And while that’s part of it, it’s not the whole picture (which is why I try to always use the term visual branding when talking about my services). So, what, then, does the term branding actually mean? The answer is both simple and complex. 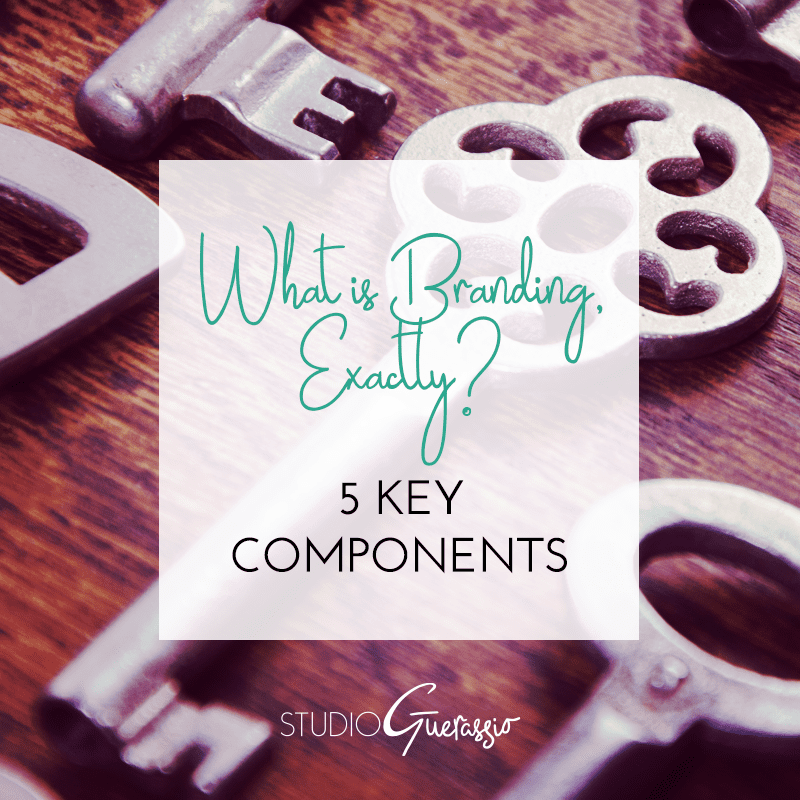 Simple because I’m breaking branding down into its five key components below. Complex because there are a lot of different factors that go into branding, and not all of them are under your control. The good news is that most of them are, and if you get those nailed down you’ve got a really solid basis for your business’ branding. This is the story of your business. Why it exists, what it considers important, how it strives to do business, what kind of vibe and personality it gives off. If you have a cause that your business is supporting, or a history that is behind why this business was started, or certain principles you want your business to stand for, those kinds of details help make up your core brand. It’s best to clarify your answers in this step before you create any of your marketing materials or have design work done. This is why I walk clients through my branding questionnaire before beginning any logo work. If you’re not clear on these intangible elements, the rest of your branding may be fine, sufficient. But it’s not going to do any heavy lifting for your business or help to really connect you to your audience. The design and layout of your website, social media graphics, print materials, etc. Colors have meanings associated with them. Fonts have personalities, photos and illustrations have moods and styles. You want to make sure that your visual choices for each of these line up with what you’re about as a business. After that, you want to make sure you’re using them consistently so that Your Look becomes recognizable and associated with your business. This is the part most often associated with the word branding. And as I said above, it’s not inaccurate, as it’s an important part of branding- just not the whole picture. Visual branding is also the part that I, as a designer, specialize in. I help you find your visual voice by taking all of those intangible ideas and translating them into designs that match and promote those same ideas. I think we can all agree there’s a difference between “Good evening, sir” and “Heya, how’s it going?” as greetings. The same goes for everything we talk and write. The words you choose to communicate with for your business can say a lot more than you think. If you’re aiming for a friendly, casual vibe, the words and phrases you use should back that up. A mismatch just causes confusion in potential customers. As with visuals, when it comes to verbals you again want to be consistent. Mood swings are not something you want your business to be known for. Includes: interactions with staff, ease of use of product, troubleshooting process, price point, etc. This is where things start to step outside of your direct control for your brand. The main point you can control with customer interactions is this: does the experience match what you advertise? Does your product or service do what you say it will? Have you communicated clearly regarding process, price, what the customer is getting or can expect? Does a customer have clear avenues for how to seek help? If you’re interacting in person, are you and your staff polite, helpful and in line with the personality of the business? Customers will weigh your brand and their experience on your authenticity, standards, and personality. If you’ve gotten the previous components squared away and have a legitimately good product/service, most of this work is already done for you. You just have to make sure the actual transaction (including any on-boarding and follow up processes) goes as smoothly as possible. That said, you can’t control everything. Things like power outages, lost shipments, website downtime, sick days, family emergencies, and customers simply being in a bad mood are all a part of doing business. How you deal with and react to potential problems is the part of your brand you need to focus on for this component. The feeling/opinion people associate with your company based on reviews, word of mouth, articles, etc. This is the component that you have zero control over. You can’t dictate what people think, after all. But, if you’ve got a solid branding base (components 1, 2 and 3) and knock it out of the park with customers (component 4), then you shouldn’t have much to worry about with this step. Give people a reason to say positive things about you with how you provide service, and they generally will. You’ll slowly build the reputation that you deserve. In the event that something damaging to your reputation comes up (a bad user review or a negative article), not all is lost. If you need to, take five minutes to have a cry or throw a fit in private, offline. Then try to evaluate whether the critique is valid or not. If your company is at fault for something, you certainly need to take steps to remedy it if you haven’t already. If the bad press is groundless, carefully weigh whether it warrants a response or not. How your business deals with negative comments or accusations is also part of your brand. You want to make sure you stick to your business’ core values in any response you put out there. Intangible, visual, verbal, experiential, and reputational. Put these all together, and your have your answer to What is Branding. It’s more complex that just your logo, but I hope seeing it laid out and explained like this also makes understanding branding simpler. Ideally it also helps you with your own business and evaluating where your branding is at, or how to build it if you’re just starting out. Did this clear up the question of ‘what is branding’ for you? If not, what else can I clarify for you?